I decided to head up to Boss Cross #2 today and actually race. 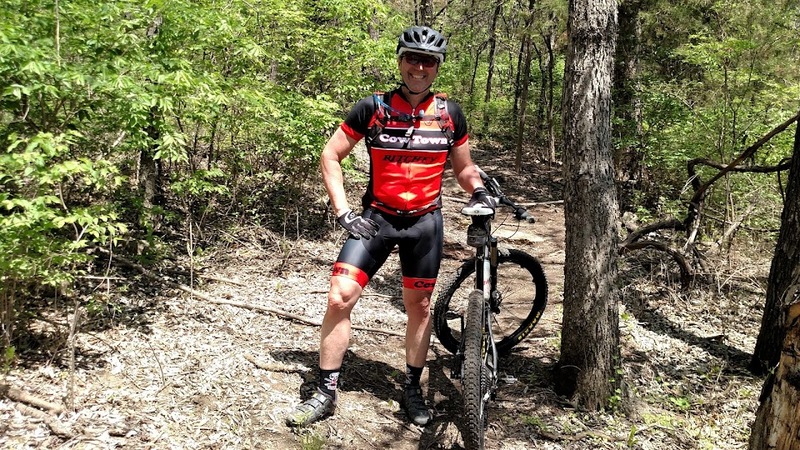 I was not going to because John Harter worked me to near death yesterday on the Smithville trails. But I needed a good training ride and knew that the only way I would get one would be if I raced. The weather here in KC is taking a turn for the worse. I lined up in the combined Men's 3/4 and Single Speed event. I did not really want to race the single speed due to a nagging left knee injury, but because I have not repaired the Colnago I had no other option. Start was uphill which sucked with the gearing I had. The top muddy section was a run for sure for me. I got a top 10 start, but quickly crashed on the way back down. I had not ridden the muddy course yet, which was a big mistake. It took me about 2 laps to get dialed in and by then I was in the back. I slowly worked my way up and into the lead of the SS division. I actually felt good after the first two laps were over and the only real problem, besides a sore/tired back from yesterday's trail work, was I could not get clipped into my pedals due to my shoes getting packed in with ice/frozen mud. Other than that I was happy with the way I rode and look forward to next weekends Missouri State Cyclocross Championships in Hermann. Carolynn took some pictures from today's race. 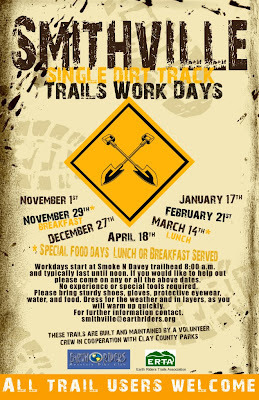 I finally got enough free time to head up to one of the Smithville Trail workdays. Trail building/repair is one tough job. Especially in cold drizzly conditions we worked in today. Today's was extra special because we also opened up a new sweet section of trail. 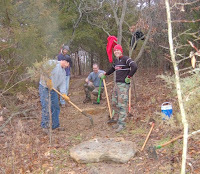 Neale Trail is named after Neale Shour who has put in countless hours of work to make the Smithville Trail system what it is today. Thanks to John Harter and everyone else who made this new section possible. It has taken over 2 years, but all their hard work was worth it when they announced the new trail to Neale. It is time to take a little break and rest up for my last two cyclocross races of the year. This weekend I am spending some quality time with the family for Thanksgiving. Then it is back to cross. First up is the Missouri State Cyclocross Championships and then the USA Cycling Cyclocross National Championships. During my little break I hope to get my new girl built up. I got a Mary SS frame last month. Since then I have been busy with promoting cross and racing which has left little time to complete this project. I do have all the parts and have been slowly getting it all together. Check out the below pictures which include my sweet new wheel set that Josh Patterson built up for me. Thank you again Josh. The Nebraska State Cyclocross Championship were on the schedule for this weekend. I was not sure if racing with tired legs/body/mind was a good idea, but decided to head up North to support the Lincoln crew and guys like Nate Woodman. Nate was sponsoring the Single Speed class and promised goodies for all. After a short warm-up the Men's Cat 3/4 and Single Speed classes were called to the line. Only got in one l ap of the course so I was decided to start in the second row. No need being up with the front runner's (or at least trying) when you don't have the course dialed in. Still got a good start and actually led the SS class for the first lap or so. Eventual winner Rick Thompson soon passed and check out with an easy race win. I had my usual mid-race collapse and had to fight hard just to get back on the podium. I was a little over geared on my SS for the top end of the course by Hooligans Hill. It was all I could do to keep my momentum on the climbs. I started to come back with two laps to go, but could not catch up to Keith for 2nd. I ended the race hoping Sunday's state championship would be a stronger showing. The SS winners got some sweet prizes from Monkey Wrench Cycles. Thank you Nate! Sunday was much the same for me. Course was run in reverse direction, but still had the climbing that was just killing my with my 18 gear in the back. If I had fresh legs it would have been fine, but with tired legs and body it was hard. I decided to start in the back and work my way up. 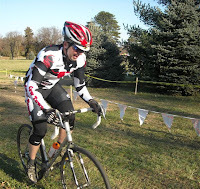 By the end of the first lap I had worked my way past several 3/4 guys and up to 2 nd in the single speed. Theodore Fleming was having a good ride (and had a larger gear for the road sections) and passed me on the road section on lap 2. Rick Thompson was up front again checking out. (Just a side note for Rick, Cat up dude :-)). I was trying to pace myself and keep Fleming close enough to try and bridge up for the final 2 laps. I knew I could push myself hard for at least two laps and had the speed to close the 10 sec gap that he had. Keith and few of the other SS riders were not far behind me. I kept using the Cat 3/4 guys on the road sections and then hit the Hooligan Hill section hard to slowly pass riders. I hit it hard with two laps to go and distanced myself from the chasing pack and passed a few more 3/4 guys to take another 3rd place and even more prizes from Nate. This time I got a nice "girly' shirt for Carolynn. Decided to put in some extra training time and signed up for the Men's 1/2/3 event. Even earned $6.00 on Hooligan's Hill. It sometimes pays to be on a leisure training ride and have the time to pickup some cash. I decided to race both the Men's 3/4 and Single Speed today. I did not have time to fix my Colnago after last weekends big get off so I had to use my SS for both classes today. Let's just say that 75 minutes on this course with a single speed was hard. I basically rode tempo today during the 3/4 event. Setting up the course this morning was really nerve racking and I needed to ride some. What better way than to race right? Ended up in 16th place and got too good of a warmup. I was toast as I lined up for my second race with just 10 minutes rest. I talked the officials into separting the 4's and the SS riders. I felt is was a lot safer for us at least. I got a jump on the 16 rider field and for a second I thought I would make it to the first turn in the lead. But a few seconds later Shad Smith, in his first single speed appearance of the series, quickly passed and was gone. I guess his 44 x 19 gear came in handy on the long start straight. I found a good line and quickly passed about a dozen riders in that first turn and for a second got out of my planned "take it easy and protect your head pace". I heard Gerard yelling at me and quickly backed it down a bit. Even with a "tempo" pace I started working my way through the field with the other Single Speeders. I could see Monkey Wrench's Rich Thompson and my teammate Mark Cole out front on one of the long straights (thanks to our red numbers). I had no goal of catching them, but wanted to bridge up to 360's Keith Walberg and Bike Tek's Justin Griest. Bill Anderson is behind me in points so I also had to keep an eye out for him. I was basically out there trying to earn enough points to win the Championship at next weeks final round - De Stad Cross Cup. On the last lap I opened her up and passed Justin for 4th place. Keith was up there about 10 seconds and I tried to catch him, but I left it one lap to late. I will take 4th place points and head into the final round with a secure points lead. If I earn a top 10 placing, I'll be set. I still don't remember much from Saturday after the crash. I need to head out to the University this week and finalize the course. I broke my helmet cam and Garmin 305 in the crash so I don't have the course to download. The course for the final round of the De Stad Cyclocross Van Kansas Series is complete. An awesome course has been designed by none other than the Cross Guru himself. Check out the pictures below. Features such as the Mound of Mercy and the Little Red Brick road will make this one great event. I will forgo everyone the pain I went through today and take out a rather nasty downhill section that had an old land mine. It must have been a land mine because when I went over it my Colnago and I went air born with me landed on my head/back. Don't remember much other than thinking "this is a good reason not to have Dura-ace on your cross bike...." Shifters are totaled, but at least I walked away. I'll have to order a new Rudy Project helmet as mine has a small crack. Today's helmets do their job, but one good hit and it is time to replace. Might have to sit out tomorrows Veterans Cross. My neck and back are killing me. University of St. Mary, Leavenworth, Kansas. ZERO traction is a 67 minute cyclocross film set to release this fall. 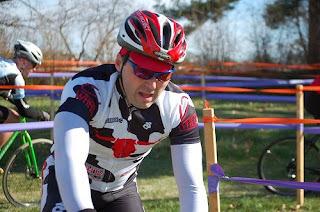 Zt was shot entirely in high definition over four days in December of 2007 at the Cyclocross National Championships in Kansas City. Zt gives you the real feel of what it is like to experience hard-core cyclocross racing in extreme weather conditions including driving snow, mud, ice and frozen mud. Zt features racing action shot in slow motion, alowing you to see details you never see with the naked eye. You’ll also see interviews from Steve Tilford, Ned Overend and elite men’s champion Tim Johnson. The film features action from 30 races cut to high energy music culminating with the exciting elite women's and men's championships. The ZEROtraction world premiere will be Wednesday November 19th at Liberty Hall in Lawrence Kansas. Be among the first to see the first ever documentary on the entire four-day event that is the USA Cycling Cyclocross National Championships.